Extreme poverty and violence has resulted in despair and neglect in the lives of families. The Stand by Me Centro Educativo Cristiano School is a beacon of hope, bringing education and care to 240 of the poorest children in the community. Our children love to attend school to escape the reality of their poverty and have fun, learn and enjoy two regular meals each day. Ketty lives with her brother and sister and grandmother in a very small two roomed wooden house. The family are among the poorest in Guacamayal. Ketty loved coming to school, but one day while attending school Ketty unexplainably began to lose the use of her legs and was taken to hospital. She underwent an operation and lumbar puncture and was finally diagnosed with transverse myelitis. 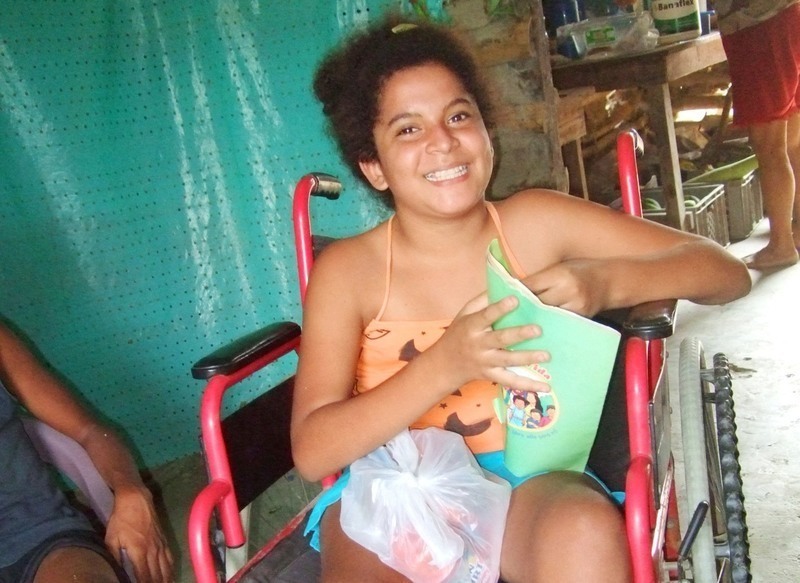 Ketty was determined to make it back to school and after treatment and physiotherapy she started to walk again. With the aid of a ‘walker’ she delightedly returned to school, sadly four months later, she found herself paralysed, once again, unable to attend class. At home, Ketty has to sleep with her grandma in a little bed, these cramped conditions add further to her distress. However despite all she is going through Ketty continues to smile and believes that one day she will be able to walk again. We would love to do more for Ketty and hope someday to be able to provide high quality medical care that will transform her life. Growing up in the midst of poverty and violence, many of the children in our care, like Ketty, have severe health issues which are worsened due to not being able to afford medical treatment. We have established a Colombia Medical fund and enable us to treat and take children to hospital who are in need of an operation, provide clinics and health screening for all our children and give courses on preventable health care. To help Ketty and children like her, please visit our Colombia Medical Priority Project page.